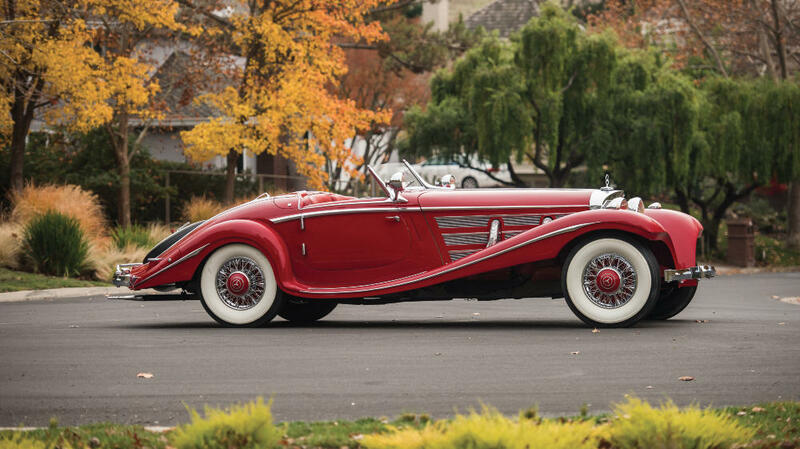 A 1937 Mercedes Benz 540 K Special Roadster is expecting to be the star of the 2016 RM Sotheby’s Arizona sale but several further German cars are on offer. 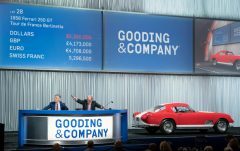 Three Mercedes Benz 300 SLs are expecting to sell for over a million dollar, as is these sports cars more luxurious sibling, a 1957 Mercedes Benz 300 Sc Cabriolet A. An almost brand new 2015 Porsche 918 Spyder is expected to sell for around $1.5 million with a 1988 Porsche 959 Komfort probably available for slightly less. A 1937 Mercedes Benz 540 K Special Roadster by Sindelfingen (est. $10,000,000 – 13,000,000) is the leading entry for the RM Sotheby’s 2016 Arizona sale. It is also by far the car with the highest estimate on offer at the 2016 Scottsdale, Arizona classic car week. If the estimate is reached, a new Scottsdale / Arizona record will be set. The 1937 Mercedes Benz 540 K Special Roadster by Sindelfingen is an original US delivery car with known history. It has the desirable longtail and high door configuration. It is one of the earliest 540 Ks made and may have been in effect a pre-production demonstration model. The car is believed to have covered only 10,277 miles since new. Barrett-Jackson’s top car at the 2016 Scottsdale classic car auction week is a 1939 Mercedes-Benz 540K Cabriolet A that should achieve around $3 million. Mercedes Benz 300 SLs are hugely popular at car auctions and although several failed to sell at too high evaluations in 2015, many will be on offer at Scottsdale and Arizona 2016. RM Sotheby’s and Gooding have three each with Bonhams offering a further roadster. Estimates range from $900,000 to $1,800,000. The 1958 Mercedes Benz 300 SL Roadster (est. $1,250,000 – 1,500,000) is the most expensive 300 SL on offer from RM Sotheby’s at Arizona 2016. This roadster is in a recently restored condition. It is finished in anthracite over grey. The 1955 Mercedes Benz 300 SL Gullwing (est. $1,100,000 – 1,500,000) on offer is considered to be in an exceptionally authentic condition with many of the chrome work original. The paintwork was changed from ivory to silver but the red interior is largely original. The car has the original chassis, engine and body numbers. The car is in a well-maintained condition but has never received a full restoration. The 1957 Mercedes Benz 300 SL Roadster (est. $1,000,000 – 1,200,000) is an early-production roadster with “Euro” headlights and a removable hardtop. The car is an older cosmetic restoration, which sits well with current preservation rather than over-restoration trends. The 1957 Mercedes Benz 300 Sc Cabriolet A (est. $1,000,000 – 1,300,000) is one of only 49 examples built making it rarer, but still less desirable than the sexier 300 SLs that it shares its engine with. The car is in a fully restored condition in correct colors and with many period additions. The 1988 Porsche 959 Komfort (est. $1,100,000 – 1,400,000) is one of only 329 of Porsche’s first supercars. The car comes with a Porsche Certificate of Authenticity and has covered only 25,500 km. Porsche 959s only recently started to sell for over a million dollars encouraging more owners to bring their cars to the market. The 959 is also helped by the 25-year rule that allow the car to be driven in many US states without the need for emission and safety certificates. The 1939 SS 100 Jaguar 2½-Litre Roadster by Van den Plas (est. $1,500,000 – 2,100,000) is fitted with coachwork by the Belgian ancestors of the more famous British-based Vanden Plas coachbuilder. The chassis was built in 1939 but Van den Plas only completed the body after the Second World War. The car was shown at the 1948 Brussels Motor Show but unfortunately a British-Belgian partnership was not established. The 1931 Bugatti Type 49 Roadster by Gangloff (est. $900,000 – 1,100,000) is one of only 470 examples of the Type 49 produced. It is on a short wheelbase and the body by Gangloff has a dickey seat and shape that inspired Bugatti’s design for the Type 55. The 17th annual RM Sotheby’s Arizona classic car auctions are scheduled for 28 & 29 January 2016 at the Arizona Biltmore Resort & Spa in Phoenix. Arizona Pre-Sale Overview – headline cars and all cars expecting to achieve a million dollar.